Hot Summer SAVINGS at the NBM Show! Graphics One will be at the NBM Show in Long Beach August 11-13th with SHOW ONLY SPECIALS! 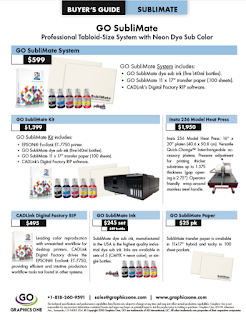 Make sure to stop by BOOTH 313 to see our GO RIO 44-inch Dye Sub Solution with new GO xPress Heat Presses, the indoor/outdoor 24-inch EcoMax Print-n-Cut Solution, and the OKI proColor Series LED Printers. Visit GO's twitter at twitter.com/GraphicsOneNews to learn more about GO at NBM. See you there!